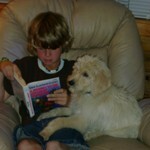 ROD: Just to keep you updated, Sequelle, our goldendoodle, is doing fabulously. She practices law with me at my law firm, and other days greets clients as my wife’s realty office. She dines with us at many restaurants and has a great disposition with passing clientele and particularly loves kids. She is the delight of our life. Submitted are a few photos of her throughout her various stages. Best regards. Our Dodger is turning 4 years old today. He is bright, full of energy, with a wonderful disposition. He loves people, loves to play and is just an all around great dog. Thank you Glamourdoodles. You have provided us with an amazing loving addition to our family. We couldn’t be happier. Hey Rod Both of them are doing great—so cute, so sweet and as you can imagine just absolutely love each other. I ended up naming them ( Harley/Yellow boy and Gigi/Black girl ). They are so sweet and so happy !! I will send you some pictures and quotes over the weekend. Thanks again !! If you are ever in or around Deerfield—you are more than welcome to come take a look at them !!! Crash was born July 2009 and we picked him out in August. 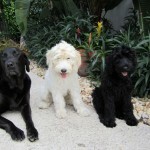 Glamour Pups were so helpful and patient with us as we went through the process of choosing the best puppy for our home. Crash is a very energetic puppy. 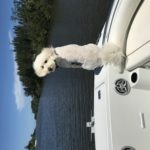 He likes to be included in whatever event his family is doing whether we are watching a movie and eating popcorn, swimming, playing soccer, or going out on the boat. Thank you Glamour Pups for answering ALL of my questions and helping our family pick out just the right dog for us. I have been looking for a puppy for years to be part our family members. We are so happy that we found glamour doodle! We are very very in love with our puppy, we named her Happy! She is happy! Healthy and highly intelligent! At ten weeks she is already knows tricks. We love her so much! Rod and Brian is so nice and help us through the process and they are honest and their puppies are so cute and healthy! I wish I can get all of them! Probably when we have bigger house we will adopt another one from you! Oh btw, all the puppies looks like teddy bear! Healthy fluffy coats!! Thanks again! 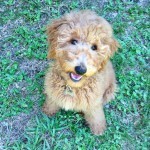 We can’t thank Glamourdoodles enough for our wonderful puppy Maica! She is extremely smart, loves the beach and water, and is great with kids! We would recommend them to anyone. Thank you Brian and Rod! I just wanted to let you know that we LOVE our puppy!!! Megan named her Ginger and she has been perfect. Just like you said, she was easliy house broken and has picked up on all of her training very quickly. She is such a loving dog!! She was 12 lbs on 7-28 and is growing fast. Attached is a picture I took this morning. I hope all is well! When you get a chance, let me know your fee’s for grooming her. We just celebrated our 1 month anniversary and this week Murphy turns 6 months. He is smart, loving, funny and a great family pet. Rod and Brian were great, I would definitely recommend Glamourdoodles! 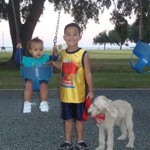 We wanted to thank you both for our sweet Rufio! He just turned 1 last October and he has changed our world! He is such a smart dog and gentle dog. We just had our first child in November and Rufio has been amazing with her. Couldn’t’ ask for a better dog! 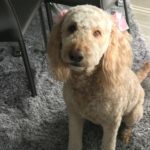 We would recommend Glamourdoodles to anyone!! You both are great and such a pleasure to work with 🙂 Wouldn’t get a dog from anyone else! Hope you are well. 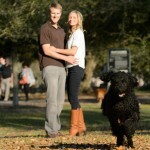 You will remember he Dutch family who bought the most gorgeous black labradoodle in your litter back in May 2011. Her name is Marley and sh is the most fantastic puppy/now a real lady we ever had. I will summarize some characteristics of Marley: -The fasted dog in town- she is really amazingly fast and has enormous level of energy -The most quiet dog when she is in our house- she likes to be in our company and is where we are -She likes our kids and is really very dedicated to keep the family together-once one of us goes away she really is confused and tries to prevent that -She does not like swimming -She is very very keen in chasing rabbits, ducks, birds and every other animal in our neighborhood -She is very good in all sorts of social events ( restaurants, cocktails, power boats � on the front seats ! etc ) as long as we do not put her on leese and fix her- she likes her freedom of moving around In summary : Marley is a fantastic dog and we all really really love her- the best buy ever Her black coat is slightly changing into salt and pepper as mentioned by you. We will sent some photo�s later. 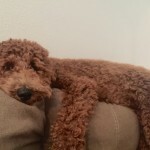 Our Doodle is now 4 years old and we picked her up at 8 weeks. She is such a delight, super smart and a great pool swimmer, but only gets in when invited. She’s adorable. We are really enjoying our doodle. He has a VERY sweet loving fun personality. He loves his family an also loves playing with other dogs He is soooo beautiful that he stops traffic!! He is very motivated by treats for training. We would definitely get another doodle!! Hope you are all well Thank you for the best cutest dog In the world!!! Birth date 07/20/2011. Daisy has been a challenge, but worth the effort. She’s been to Nova Scotia, Cape Cod, Houston, and on and on. Loves to ride in the car. Doesn’t go anywhere near our pool, although we tried many times to get her to swim. Go figure! Loves to romp around the house and play catch me if you can. Definitely treated better than the three girls we raised, yes she is spoiled. We could go on and on, but we’re sure you figured out where our heads are at. We have recommended Glamour Doodles to many friends, they do a great job. Hey Rod. Lola is growing and learning so much everyday. She is such a sweet, playful and good girl. She is almost 5 months now! In this picture, she is celebrating her “brother’s” 10th birthday. They play and run with each other all the time. She’s been great for bringing his youth back out. 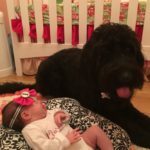 Thank you so much for preparing her as a baby to be such a great dog. Everyone that sees and meets her wants to know where we got her! Thanks again. I had never had a dog before I got Bruno in April of this year. 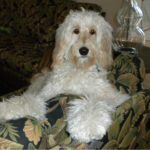 I have a dog allergy, but when my doctors and I decided a Service Dog was a necessary step in my treatment, a Goldendoodle sounded like the perfect option. And we were right, he lives in my dorm room with me, and doesn’t bother my asthma or allergies in the slightest. Since the Easter morning I brought him home, Bruno has been hands down the best thing to ever happen to my family and I. He was practically potty trained from day one. He picked up on things so quickly. He is an incredible dog, and my vet cleared him for service work with flying colors! He has an incredible temperament, a gorgeous coat (which he gets from his dad, Romeo), and is the most loving dog in the world. I don’t think I’ve ever met someone who does not tell me he looks completely fake because of how perfect his coat is! Of course, he keeps me entertained with his antics, but he is also such an in-tune, incredible companion and he has changed my life unbelievably. I recommend Glamour Doodles to anyone who will listen. These dogs are absolutely incredible, and I cannot wait until I have the means to adopt a second one. And possibly a third if I can help it. Hi Rod! We wanted to check in with you guys and thank you again for all of the help that you provided us with while choosing our first puppy! Our baby girl, Derby, is just AMAZING! Matt’s allergies haven’t even been an issue thanks to that great hypo-allergenic hair! Derby is just over 1 years old now, and I can’t say enough about her personality. She is a goofball and a sweetheart all at the same time. She was the perfect match for us, and we can’t thank you enough for all that you did during the process – especially starting her a few days early with the cage training. She loves her cage, and I truly believe that it is due to the fact that she started young! She completes our home and we can’t wait to get her a little sister real soon! Thank you SOOO much Our puppy Riley is AMAZING!!! We Can’t wait to get another one!!! a darker one next time cause Riley is kinda turning White! but he is soooo smart and sweet and everything we wanted!! Thank you thank you thank you!! We love our sweet little Lilly. She is such a good puppy. Lilly’s temperament is so amazing she is not scared of the vacuum, pots or pans bagging, blender and ect. Loud noises do not scare her. She is a fun loving dog. Very smart and we have already started training her. She is fast learner. OH MY GOD!! We LOVE OUR IZZY! 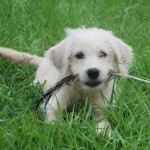 She is full of energy, adorable, very sensitive and the most social dog on the block! 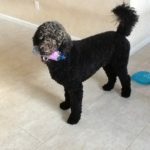 She weighs in at 49 pounds � doesn�t look like a lab or a poodle � she�s perfect. Loves attention and is the apple of my families eye! Don�t know how she was born in Florida, she hates hot weather! 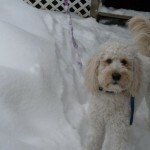 She follows me around everywhere and whimpers when I leave � do you think she is a little spoiled???? 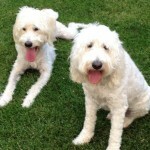 Rod, We just wanted to thank you again for our two wonderful labradoodles. 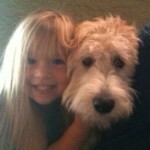 My daughter is allergic to pet dander and has always wanted a dog. After contacting you we thought we would give it a try, but were hesitant because of her allergic breakouts. We live in Tampa, and you brought the two puppies to us and allowed us to keep them for twenty-four hours just to see how my daughter would react. It was great!!! We decided on getting two as we only saw it fitting because we have two daughters. I am so glad that we did!! Ali (black female) and Bama (cream male) are best friends. They do everything together and can’t stand if they are apart. They were very easy to train and had very few accidents the first month. They love to swim, play with other dogs, and snuggle when we are hanging out. What is more amazing is that they never went through a chewing phase. 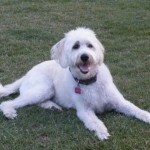 We also keep their hair cut short, because of the heat and the fact that they love to be outside and play. Thank you so much for everything 🙂 I have attached a few pictures. I can not express enough how Wonderful these Doodles are! Rod and Brian do such an amazing job!We got Fenway at around 8wks old and he was already house trained and within a week he was bell trained. We look forward to adding more Doodles to our family in the future and will go no where else!! I am so glad you got in touch with me as I had lost your number and want to show a picture of our precious Jake. I am not making this up when I tell you that every single day when I take him for a walk someone stops my car and tells me that he should be in the movies. I am not kidding. Not only that he is huge! The firs time I to the Vet he fell asleep on the table. Now every time he weighs him he can’t believe it. He must be about 65 lbs. At the end of the month we are getting him fixed. He is the sweetest, most agreeable dog in the world. He loves all dogs and all people. He is also a wise-guy. But it is impossible to get mad at this face. He doesn’t chew my shoes, he just steals them and puts them on his “place” so that I know he can out wit me. He has eaten everything from a small coconut, to sewing needles and razor blades before he learned his lesson. My Vet says he must be a goat because nothing ever happens to him. He is my baby boy and I try so hard not to spoil him. Everybody loves him. He is so silly. He doesn’t like to swim which is a bit of a disappointment, but I think it is just because he is still a puppy. Next summer I predict he will be jumping in the pool. He is a pretty good watch dog when he is in the house, but outside he just licks everybody to death. I hope you are well. Here are a few pics. Everybody says e should have named him Chewbacka (Starwars) cause he is so fluffy. Or Alf for the old cartoon. But my grandson wanted to name him Jake Sully after the hero in Avatar so Jake it is. I am so happy with this dog and cannot thank you enough. Easily toilet trained, Only used the crate for about a month. I leave him alone in the house and all is well. But I don’t go out for long periods of time. 3 hours max for the time being. Hi Rod. Just wanted to give you an update on our puppy, Andy, that we purchased from you. 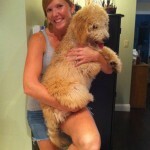 He is 5 1/2 months old now and weighs about 45lbs…..I think he’ll easily make it to 55 or so as an adult. Just had him neutered, although having surgery didn’t slow him down at all. He is one active boy…..and when he settles down, he is very loving. He is super smart, of course. Everyone thinks he is adorable, and the whole vet office loves him. I’m attaching a picture that I took a couple of weeks ago. Just wanted you to know that he’s happy and healthy and that we love him a lot. Hope you are well!! Harley is very smart. She learned sit within 24 hours. I now don’t have to say sit before I put the leash on to go outside, she knows when we go to the door to sit automatically. I also spent 2 days working on ‘stay’ and by the end of the second day I can backup all the way across the living room and she stays put till I say ‘come’. My fiance has fallen in love with her and keeps trying to sneek her into bed at night instead of making her sleep in the crate. It makes my sad to see that her brother hasn’t found a home yet.. I sure hope someone takes him home soon! I will send pictures soon, as soon as I can get some good ones of her and Topaz together. I am writing to you to thank you soo much for helping us find our Zeke, the apricot male who stole my heart when you sent the photo. He turned 6 months old the other day and he is just amazing !! Of course he is a puppy doing puppy things as any healthy all american puppy does but he blows us away with how intelligent he is, considering we thought he would be just another pretty face. He’s done so well with some of the training classes and the trainer just loves him. He is so well adjusted and takes all his trials ( the vet ) and tribulations ( the injections ) like a champ. Again, he won the hearts of the girls in the vets office. I thank you for being so wonderful and patient with me during the process of choosing the right puppy but you knew immediately what I wanted and before I knew it, you sent me the photo that sealed the deal. It was wonderful working with you and I would gladly answer anyone’s questions who is considering buying one of your puppies. I know that we will stay in touch and I will send you photos soon ( Zeke’s graduation pic is just beyond ! ) I wish you every happiness and I hope to be able to stop by soon and let you check Zeke out and see how happy he has made us. Once called Snowy. Leia is the best dog ever! We absolutly love her! She has grown so much and so strong and so smart… She is amazing!!! We all love her so so much. I hired a trainer and he just came 3 times! After that he said she was the smartest dog he had meet in 15 years and she did not need any more lessons!!! She goes jogging with me every day. 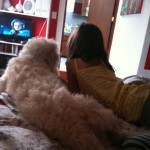 She is the best with my daughters and my oldest dog. She is playful when there is a chance to be and a ladu when she needs to be. We adore her! Best buy ever! She became a part of our family the day she arrived. 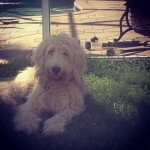 She was the cutest puppy and now at 8 months she is the loveliest mop head in the world. I’ll send more pics. Thanks all the way from Mexico! Hi everyone!!! This is Enzo….the best birthday present I could ever have received!!! His name is Italian for “Henry” which means “rules the house”!!! That he certainly does!!! Ken and I are in love with this beautiful creature!!! Thanks for the great job you doing in raising the sweetest, most adorable dogs I’ve ever seen! I will keep you posted as he continues to grow. This pic was taken April 6th, on my birthday! Oliver has been so good for us! He’s much bigger than we had anticipated but he is a LOVE, gives kisses all the time and loves everyone! 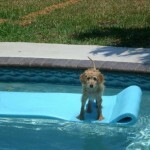 He loves to sit in the pool, chase lizards into the trees, run and play catch! What energy! He has such a great personality! Sherlock is the smartest dog I have ever had, and that is saying something because I have had a few in my life. I knew I had found what I was looking for in a service dog candidate for my type-1 daughter the first time we exposed him to a scent sample. He is bright, beautiful, and will represent safety and freedom for Bayleigh as she takes him off to college with her next year. Great dog! Thanks Glamour Doodles for our fluffy girl Sheila. She is not only the smartest dog we’ve ever had,she’s the smartest dog we’ve ever known. She loves to go swimming and snuggle with our son at story time. Thanks for the beautiful addition to our family! We recently celebrated Honey’s first birthday. We are so in love with our puppy. She is so smart and so good. When we are out, everyone stops to admire her. Thank you for allowing us to bring her into our life. We love her so much. 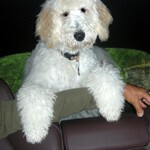 Rod, Roger and I wanted to thank for you such a wonderful labradoodle. She is doing just great. The crate training is going better than I thought it would. Lexi is sleeping through the night and no accidents. She loves playing with the boys. Playing fetch and tug a war seem to be her favorite right now. We are so thrilled to have Lexi in our family now. I will send pictures soon. She is growing so quickly. Looks like you have sold a few of her siblings also, not too many left on website. Take care and thanks again. We got our puppy from Glamour Doodles last fall. We’d been searching for a family dog for about six months, but many of the breeders we spoke with were more interested in having their puppies involved in competition and shows. Rod was different. He told us that he had been the show dog route, but now was interested in breeding dogs that were going to be loved as family members. We were nervous when we met his litter of pups, because we had no dog experience. But Rod talked to us about care and training and let us have all the time we needed interacting with the dogs. 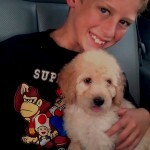 There was no pressure to take a puppy home that day, but our boys wouldn’t leave without one. We chose what appeared to be the calmest puppy in the litter and named him Gizmo. Gizmo was easily house broken and crate trained. He has become a personable member of the family. He accompanies me on my morning runs. He chases and plays hide and seek with the boys. He cuddles with us all on the couch at movie time. In short, he is the perfect mix of recreation and relaxation. We couldn’t imagine life without Gizmo. Rod, We are all doing well, thank you for asking. Mr. Chew and the kids are all doing fine. Thanks to Mr.Chew we are enjoying the outdoors a whole lot more. We couldn’t be happier with the addition of Mr. Chew to our family. Thank you again. Our little Oliver is no longer a “little” guy and growing up handsomely! 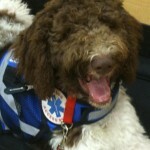 He is energetic and taking well to his intermediate puppy training classes after graduating his puppy class. He has learned his commands quickly and at 5 months old is learning very quickly what he can and cannot get away with! 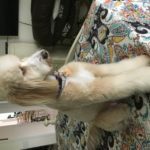 He has a playful brotherly relationship with Cody, our first goldendoodle, and loves to run and tackle each other and play play play as boys do!! Thank you for our wonderful addition to our family, Ollie has brought us more love with all his kisses. 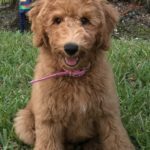 We bought one of your F1B Goldendoodles in your first litter and we can’t tell you how much we love her! 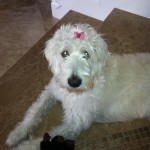 Our dog Bella has brought us much joy in our lives and means the world to us. She is always by our sides, she is the sweetest thing. Bella taught us a very important lesson in our lives, never give up. My sister is highly allergic to dogs and is one of her favorite things. Every time we would see her doctor we would always ask “is she healthy enough to have a dog”. One afternoon we went in and asked that same question and he replied with the answer yes, you could try. I will always remember that day. 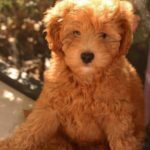 When we got home we searched for our puppy for months and months and finally found our dream puppy on your website Glamour Pups. When we saw her picture we knew she was waiting for us. From the moment we picked her up she has been the most healthy and enjoyable puppy. 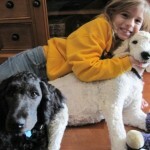 We highly recommend you and believe you have the best doodles! Thank you for providing us with a treasure like Bella. Bella is the best thing that has happened to me. I will always stand by her. Pictures to come! I met someone who had purchased a dog from Glamourdoodles and loved their dog. I put a deposit down that night and waited patiently. I did not get a lot of pictures or information on the dog and I did not even meet the parents when I picked him up. However, I’d do it again in a heartbeat. I have a cream color male who is a F1b and his name is Fernando. Absolutely hands down the most gregarious fun friendly personable dog I have ever had. 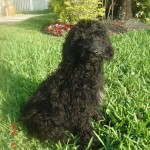 He is the perfect dog for me friendly and attentive and makes a great companion. He loves the water and swims in the pool daily. He also loves the boat and crawls all over it like a goat. He is a big fisherman and will come running when he hears the drag on your reel. Thanks for a great healthy happy animal! People never ask me why I would pay for a dog after meeting Fernando. They ask if I know if any are currently available! Hi Rod, I’ve been meaning to write to you for a long time now. I just wanted to let you know that Charlie is literally a DREAM DOG! My fiance and I keep asking ourselves how we got such a perfect dog and feel so lucky to have her in our lives. We are so in love with her and she has the most incredible temperament of any dog I’ve ever known. She is so mellow and easy going and just wants to be close to us. She does have a playful side and her favorite game is hide and seek, but what she really loves to do is snuggle up with us and just hang out. When anybody meets her they are immediately charmed by her sweet demeanor how calm she is at 1 year old! She is a perfect companion and we can’t thank you enough for her. If anyone ever says they are interested in a dog I always send them your way because of our great experience. Also, my allergies haven’t been an issue in a long time and my mother who is highly allergic to dogs was completely fine when she came to visit! I’ve attached some of her latest pictures so that you can see how well she’s doing. 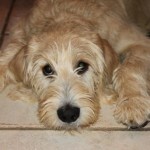 Our 4 1/2 month old Doodle Dodger just came back from a short training session with Professionals. They told us how smart and alert Doodles were and particularly how great Dodger was doing. Vet told us he was a very healthy Puppy with a great coat. My wife and I couldn’t be happier with the Dog we received from Glamourdoodles. They obviously did a great job in breeding according to the Professional and more importantly according to US!!! Thanks you so much for the joy he is bringing to our home. Lauren said you wanted some photos of Penny, so here they are! We absolutely love her. She is the most well tempered pup we’ve come across. She can’t get enough of the dog park, and she loves hanging out on the boat! She is the nicest pup – everyone that meets her is absolutely delighted and cannot get over how cute she is. She weighs about 60 pounds at 10-11 months, she has a beautiful white coat, and she’s getting stronger and faster every day. Even though these are some great pictures, they still don’t do her justice. 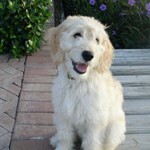 When we are ready for another pup we will definitely pick him/her out from a litter at Glamourdoodles! 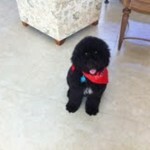 Rod and Brian we just want to thank you for the most wonderful and loving puppy ever!! She has brought so much joy to our house. We have given multiple recommendations to many of our friends. We can say you do a wonderful job breeding puppies! She is just such a lover! Thank you for bringing such joy to our house!! Rod, The puppy is doing well, weighs in at 18.2 lbs. as of Wednesday. Tomorrow, or Sunday, I will post a picture, had to get a new camera to get pictures, they grow so fast. Again, thank you for all your care and listening when I thought there was a problem with the dog. Her name is Sasha, the girl at my veterinarian came up with the name, as she was sassy to a big dog, and when she told me the name, I remembered that my dad had a chocolate lab female, about 80 lbs. named Sasha. Since my Dad just passed away a month ago, and was a big dog lover, I felt it was the right name for her. She is walking well on leash, has known where home is for over 1 1/2 weeks, can tell our gate from all the others, comes when I call her, sits, and I have hardly started good training with her. I gave my 2 week notice from my second job, because I need to spend quality time with her. Surprisingly enough, my husband, who really did not want a dog, took to her and has been taking her to the beach every morning. she enjoys car rides and being at the beach. Later this weekend, I will put up a nice testimonial that you can use, and will recommend you to anyone. Do you have any puppies left from the litter? I had someone ask me. Rod and Brian, I just wanted to thank y’all for our sweet Kami! 🙂 she is 4 months old now and we love her to pieces! Throughout the adoption process you were so helpful and nice!! I would recommend anyone looking for a doodle to y’all!!! We love our sweet Kami and couldn’t imagine our life without her!! 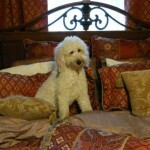 I’m finally getting around to adding a note on your site about Macy. This is a current picture of her and my daughter. She is now 16 weeks old and a little over 25 lbs. She is just the greatest puppy, she is my best “little” friend and follows me every where. She has been doing great with training and is a joy to have around. 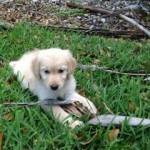 She loves to fetch and could chase a ball for hours, she runs really fast and loves to be in the pool or lake swimming. It’s hard to believe she’s only been with us a few months, it seems like she has lived here forever. Thank you.